Premium Quality DQ-TUQ60 Black Toner Cartridge compatible with the Panasonic DP-7240, DP-8540. The use of compatible supplies does not void your printer warranty. Premium Quality T-1200E Black Copier Toner compatible with the Toshiba e-Studio 120, e-Studio 150, e-Studio 162, e-Studio 162D. The use of compatible supplies does not void your printer warranty. Premium Quality T-120P Black Copier Toner (4 pk) compatible with the Toshiba BD-1210, BD-2810. The use of compatible supplies does not void your printer warranty. Premium Quality T-1550 Black Copier Toner (4 pk) compatible with the Toshiba BD-1550, BD-1560. The use of compatible supplies does not void your printer warranty. 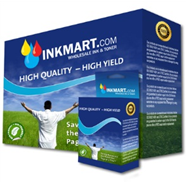 Premium Quality T-1570 Black Copier Toner (10 pk) compatible with the Toshiba DP-1570, DP-1870F. The use of compatible supplies does not void your printer warranty. 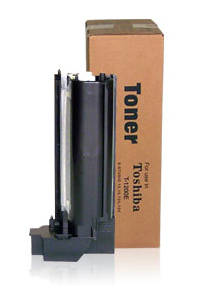 Premium Quality T-1600 Black Copier Toner (2 pk) compatible with the Toshiba e-Studio 16. The use of compatible supplies does not void your printer warranty.